The world of search is changing all the time and if you’re not staying up-to-date on the various algorithm and SERP changes, you’re likely going to miss out on big opportunities that can present themselves out of nowhere. In the traditional sense, an SEO strategy entails having a soundly structured website with effective internal linking, an eye-catching design, captivating content that utilizes relevant and highly-searched keywords, getting quality backlinks, etc. But what if you’re doing all these things and you’re still not getting the desired results? This is where diving just a little deeper and gaining more knowledge can separate your brand and give you insights on how to boost SEO content. SERP real estate dedicated to organic links is smaller than it has been in the past, however, there is still incredible opportunity to build organic visibility, brand authority and increase your organic clicks. It is simply a matter of tapping into the evolving world of SEO and realizing the potential changes happening to search engine results pages so they may be taken advantage of. By boosting your content efforts and taking advantage of various changes as they happen, you’re more likely to gain the traction you’ve been missing out on. One area of organic search that has garnered significant attention as of late is voice search and featured snippets and whether or not you should be optimizing for them. Should You Be Optimizing for Featured Snippets? 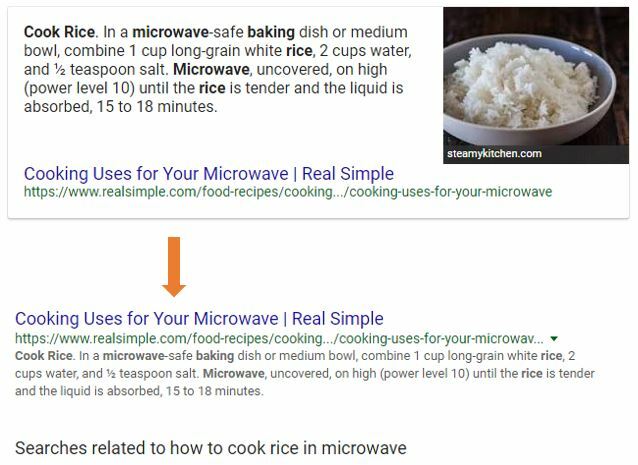 When a featured snippet appears for a query (often for question-type searches), the snippet appears on top and another organic result with the same URL appears somewhere down the page. What this means is your website has just garnered a massive amount of SERP real estate for the entered query. Deciding whether or not to optimize for position 0, as it is often called, can depend on a variety of factors. If you’re already ranking strongly for a variety of different keywords and you do not find it necessary, optimizing for featured snippets may not be the right route. However, in many cases, a featured snippet is not pulled from the first or second position on the SERPs. In fact, results far down on page 1 and perhaps even page 2 can land in position 0. Take for example, the search query: “how to cook rice in microwave”. The result includes a snippet that is not even close to the top. It is pulled all the way from position 10. It is safe to say any site owner would rather appear at the top of page 1 rather than the bottom. If you can optimize for position 0, Google has determined that your page is an authoritative source on the query subject matter. Being deemed an authoritative source in the world of search engine optimization is always considered a win. Some SEO tools such as Ahrefs and Linkdex include capabilities to find featured snippets or featured snippet opportunities. Here is where a swift competitor analysis can be instrumental in giving your site an SEO boost. Enormously valuable insights can be gained by looking at what your competitors are doing both onsite and off. It can help you understand where the content gaps on your website are, what type of keywords you have potential to gain visibility for, and the type of content you should be creating around those keywords. If the content in question does not fall directly in line with your business offerings, the topic(s) in question can be great candidates for blog posting. Digging through your existing keyword rankings can also benefit when determining what your content gaps are. Surprisingly, you may find that you are ranking on the SERPs for keywords that you don’t even have dedicated pages for. If you find this to be the case, you may want to create new pages around these keywords and use the ranking page to internally link to your new page; passing the link juice onto the new page. Remember to only create content around keywords and topics if your brand has something important to say around it. Otherwise you might drive traffic, but this traffic is unlikely to convert or bring any real value. By moving towards a strategy that focuses more on your audience and less on the keywords, you are more likely to create content that leads to higher conversions. Understanding your audience and what their major pain points are will give you a better understanding of how to purpose your content to speak to them. You won’t likely find customer insights while doing keyword research. A helpful tip would be to begin talking to employees in customer service or those that spend time talking with your customers and other stakeholders and asking what are the most common questions, comments, and concerns they ask. Take this information and try rolling it into the content you produce because it is likely that your audience is searching for answers to these questions online as well as in person. Going the extra mile with your SEO strategy can payoff massively but it can be challenging. If you need an SEO boost, get in touch with Anvil for help increasing your organic visibility.